Too late for me to do an entry now! I'd love to participate in a food blogging event, but never find out about them until it's too late!!! These spring rolls look good, and I DO have all those spring roll wrappers in the freezer that we picked up in china town...I guess I could just eat the filling, lol. Hi Nic! I love spring rolls and yours look sooooooo yummy. Patricia was chuffed that you commented on her blog, thanks for visiting. Her food is every bit as good as it looks! I have added a link to your blog on our site. Marie - the filling is just as good on its own! Friedel - I feel like I have won the lottery when I get a nice comment! Someone out there has read my blog!!! It looks like you are staying at a wonderful place. I have put 'Travelling Two' on here. Take care on your amazing adventure! another visitor to your blog here, hi nicisme! 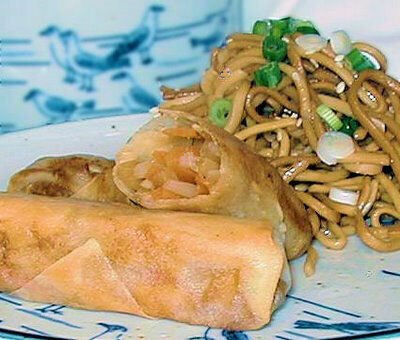 the spring rolls look delicious - despite the fact that it's breakfast time, i could eat one right now! thanks for participating in vegetables, beautiful vegetables! Thanks for visiting - and for hosting the vegetarian blogging event - I am really looking forward to the round-up and getting some new ideas and recipes to make.